If you’re an owner of a storage facility, you’re probably looking for ways to better serve your customers as well as build the prosperity of your business. Name recognition is a big part of running a successful business, and U-Haul’s Storage Affiliate Advertising Vans can promote your business by advertising on wheels while empowering you to provide a convenient service for your customers. We use the newest model of the Ford Transit, which establishes a standard of reliability, consistency, and freshness for your clients to enjoy. The ease and availability of having a moving van ready to go will make your business even more customer-oriented. In addition to the van, your customers can benefit from a variety of U-Haul moving supplies available at your facility for an affordable price. Advertising on wheels not only supports the ease of transportation of storage goods but more opportunities to meet your clientele’s needs all while promoting your business. Americans spend an average of 15 hours per week in their cars. This means 15 hours of opportunity to see your company’s logo! The road is ripe for recruiting customers. People all over town will notice your logo cruising around, and they’ll know who to call for their storage needs! 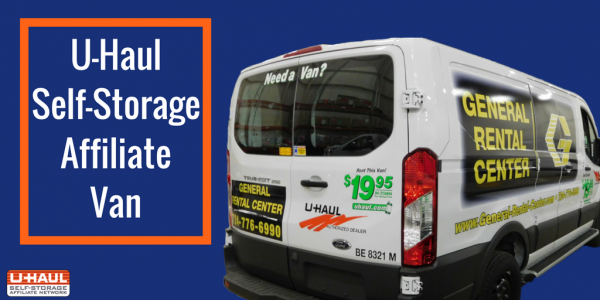 U-Haul’s Storage Affiliate Advertising Van presents a unique opportunity to immediately improve both revenue and customer experience. U-Haul assumes responsibility for the vans, meaning that you as a business owner will not be liable for SAAV accidents, nor will you be responsible for maintenance costs, repair costs, or impoundment fees. A SAAV can empower you to elevate your brand recognition, prestige, and income stream. U-Haul’s Self-Storage Affiliates who meet the requirements have a unique opportunity to deepen a valuable relationship with U-Haul and with clients. Now, are you ready to start advertising on wheels?